How much a person pays for electricity depends on a variety of factors — including where they live and who they get their power from. This map shows the average revenue from bundled sales per kilowatt-hour for residential, commercial, and industrial customers served by public power, cooperative, and investor-owned utilities in 2016. 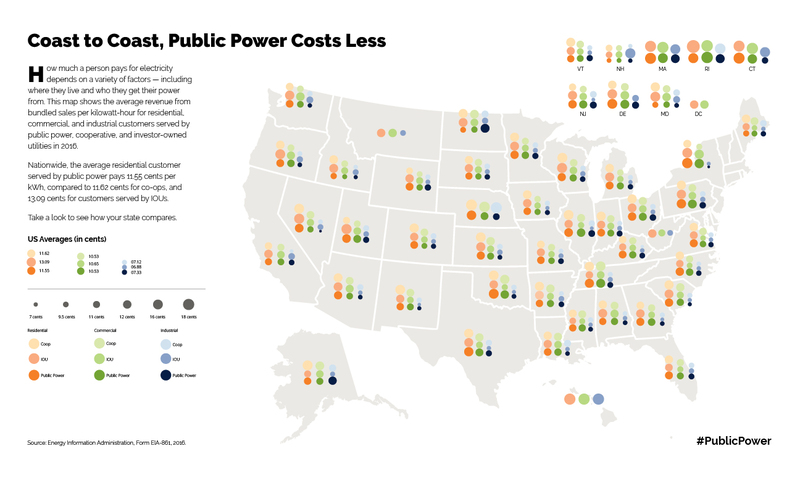 Nationwide, the average residential customer served by public power pays 11.55 cents per kWh, compared to 11.62 cents for co-ops, and 13.09 cents for customers served by IOUs. Take a look to see how your state compares.